Montana Test.com - Results for: Dakota Dual Purpose Hen Turkey Decoy! Master carver, Dave Constantine, has done it again! 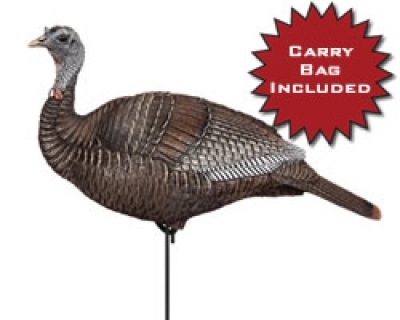 We are proud to introduce our NEW, Extreme Hen Turkey Decoy. With his decades of turkey hunting experience, Dave has developed the ultimate, Dual Purpose Hen Decoy. The perfect body posture of a standing, not alert wild hen, that when set on the ground doubles as a pre-breed profile of a ready hen. Dakota's signature quality, detailing and realism are unsurpassed. The perfect companion to the Dakota Decoy Extreme Jake.